This last week, hammers beat down on nails, door knobs were picked up and screwed in, the final touches on paint were done and the compost toilet was securely snugged into the wall. The team found our energy to complete these final touches from freestyle rap sessions during lunch breaks and the anticipation of a happy couple who would soon be receiving their new home. We were all anxious, we were focused, and we were so excited to see the final bits come together and those once single pieces of wood and never before lit Edison bulbs, make a home. Completing a project like this is extremely exciting for us here at Heirloom. It isn’t just about getting it done and moving on to the next big thing. 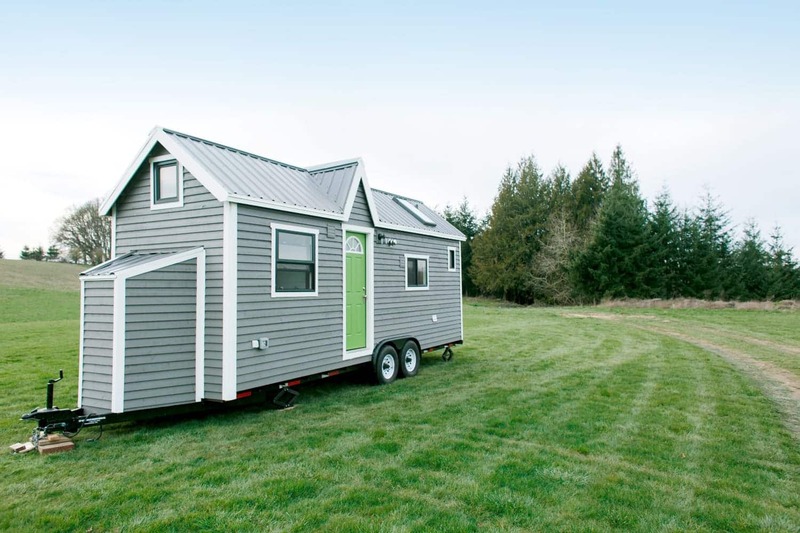 It is about the process we journeyed together to get to where we are, the memories we made along the way, and the new friends we get to deliver this tiny home to when it is all finished. We here are all just a bunch of friends and family, having fun and building homes. And when one of our Tiny Heirloom’s are complete, that just makes us even closer. And it makes it even better when that person, couple, or family, suddenly becomes a part of the Heirloom crew as well. Whether thousands of miles away in Texas living in their Tiny Heirloom or someone right here in Portland, we care about our Heirloom owners as if they were one of our very own. This last Tuesday, we had a photoshoot for this newest home. Along with the excitement of the anticipating folks who would soon be living inside these walls, we also made some amazing new friends who filled it with some goodies for our shoot. Michelle, Katie Rae and Brianna travelled around Portland and collected some of the most beautiful products from some of our favorite brands. As you look through our newest home and see some of the amazing touches, you’ll see a few of these products. The Indigo blue rug from Kush Rug, the beautiful pillows, coasters, hat and other products loaned from Made Here PDX, or the unique chestnut Aurora lamp from The Good Flock! Take a look and go check out these amazing stores. Custom made wooden tables, granite countertops, and extra counter space for a couple whose love language is found in the kitchen with a knife and skillet. These are some of the qualities that we believe make Heirloom, simply Heirloom. We love to customize for our clients. We believe that going smaller, doesn’t always have to mean sacrificing the things that makes your home, a home. So, as we moved forward in our photoshoot, these were obviously things we wanted to capture; our local partners, and the unique customizations of each of our homes. This was an amazing shoot and an amazing project we are really proud of! Check out the pictures below and stay tuned in the coming months for our next Heirloom!